Are you ready for a new week of Craftastic things?! I totally am. Link up your sewing, crafts, knitting, decor, cooking, DIY, anything craftastic is fair game. Got more than one project? There's no limit on how many links you can add! Look at this great jewelry tutorial from Bilingual Crafting and Sewing. A lovely bow bracelet for a thrifty price! 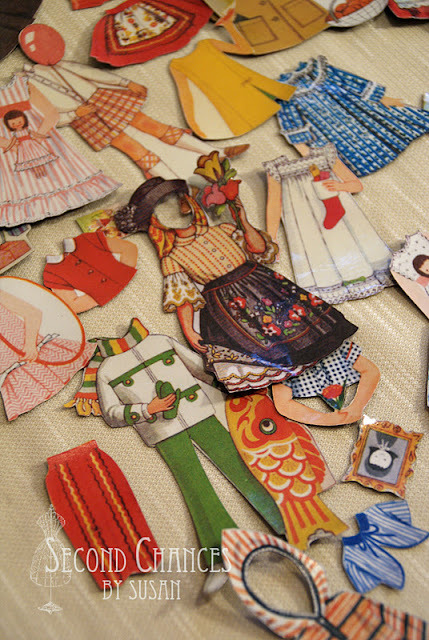 Check out this awesome idea from Second Chances by Susan - she used vintage paper doll images and made magnetic paper dolls! I'm totally bookmarking these gorgeous girls. Green Eggs and Hamm linked up her tutorial for some furry animal hoods to keep kids toasty and have fun at the same time. How about this boredom buster from Making Memories? She shares an easy, fun (and not super messy) "soap explosion" that will have the kids totally wowed. Cannot WAIT to try this with my kiddies!! That Soap thing looks FUN!! I will have to head on over and check it out!!! Just linked up "Going To The Circus" thank you for hosting.. Maximum Discount guaranteed. Form a group and avail group discount. Interesting deals available. Thank you so much for featuring me. Gosh, so excited about it. I wonder if you can get Ivory soap here in Australia. Will have to be on the lookout. I linked up my really cute and really Easy Lace Shirt. This is a great project for a beginner sewer-or an experienced one. Thanks for hosting the party once again. Have a great day! Thank you so much for featuring my Animal Hoods! Totally makes my Monday! Oops sorry! I linked twice... also I am having a hard time linking with your button... any help?! Thank you so much for hosting such a wonderful party!! There are so many lovely things to look at on your blog!